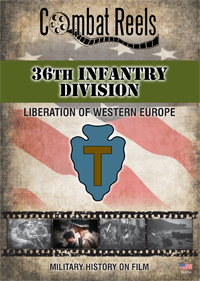 This DVD about the 36th Infantry Division takes place in World War II during the Fall of 1944, Europe. is successfully reached and relieved. The contents of this video show the action as was recorded by the 163rd Signal Photo Company, during these historic operations. The footage in this video is intended to be strictly that of the 36th Infantry Division and only shows other unit footage when two or more units are intertwined. Combat Reels has researched and compiled all of this raw combat film footage, then reformatted it into the DVD format for your viewing pleasure. as artillery shells filled with supplies are fired to them, and men from the Japanese-American Regiment fight to reach the cut-off unit over ground.. Enjoy these close up shots of the actual locations the 83rd Division fought for and occupied. Examine as well, the equipment, vehicles, weapons, uniforms, helmet markings, and the faces of the men themselves on these candid reels of history.